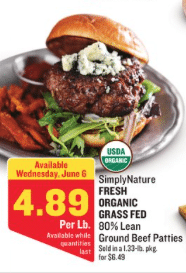 For a limited time, Aldi is offering up a hot price on SimplyNature organic, grass-fed fresh beef burger patties. Get a 4-pack (total 1.33 lb.) for just $6.49, so that comes out to just $4.89 lb! 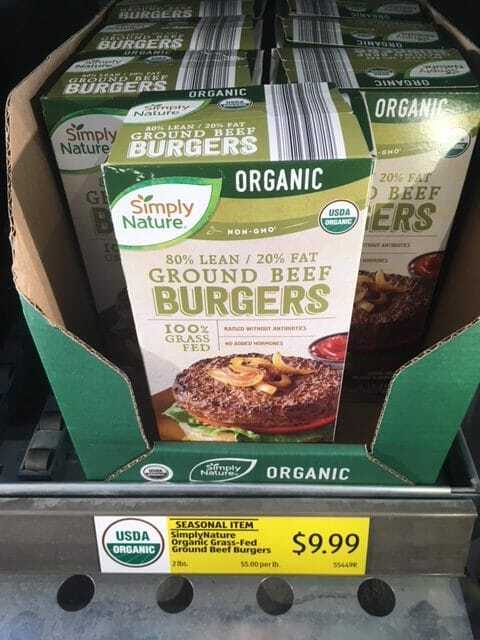 They also have frozen organic, grass-fed beef patties for $9.99 for 2 lb,, so just $5 lb. Compare this price to Whole Foods, where they charge $10 for 1 lb. organic, grass-fed beef patties. Stock up while you can at Aldi! These are both seasonal items, so they’re available while supplies last.